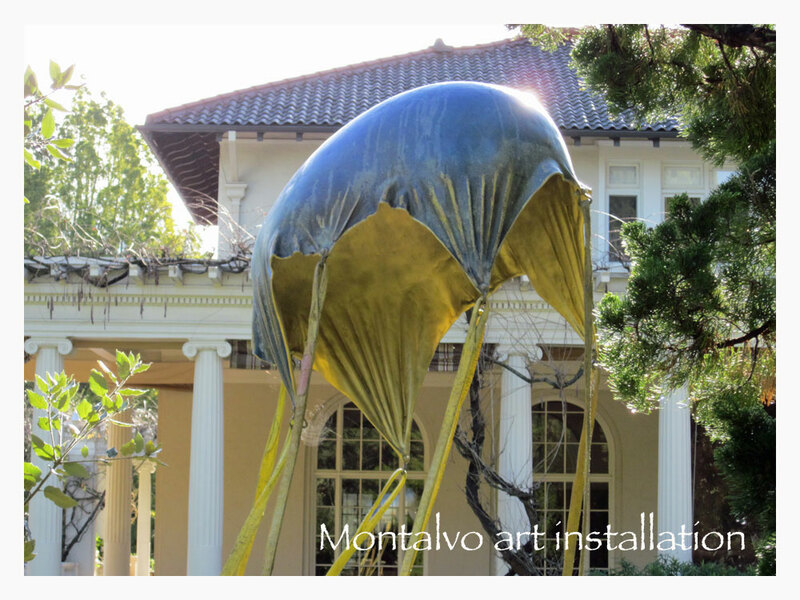 One of our favorite morning walks in California takes us through the gardens of the beautiful Villa Montalvo Center for the Arts. You never know what you might find around each wooded turn because they’re constantly changing the outdoor sculptures, providing that element of surprise. 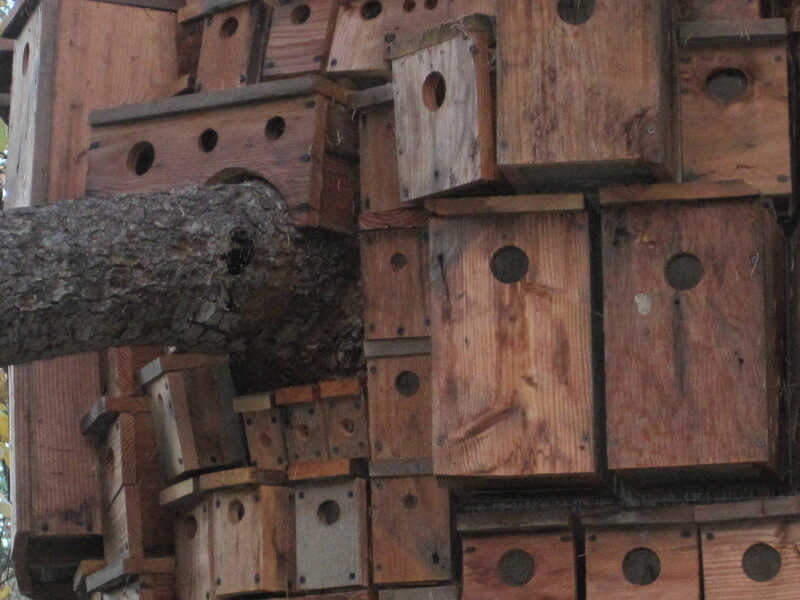 One day we found an artist constructing a fairly large house out of sticks. Another time we came upon a new fortress in the front yard made entirely from stacks of paper (even more interesting after it rained). Then there were the strange heavy, unexplained floating objects. And let’s not forget the creepy giant cocoons the size of a small car, we found laying by the path up the hill. But today, our sculpture hunt was a little more challenging—like up in a tree! 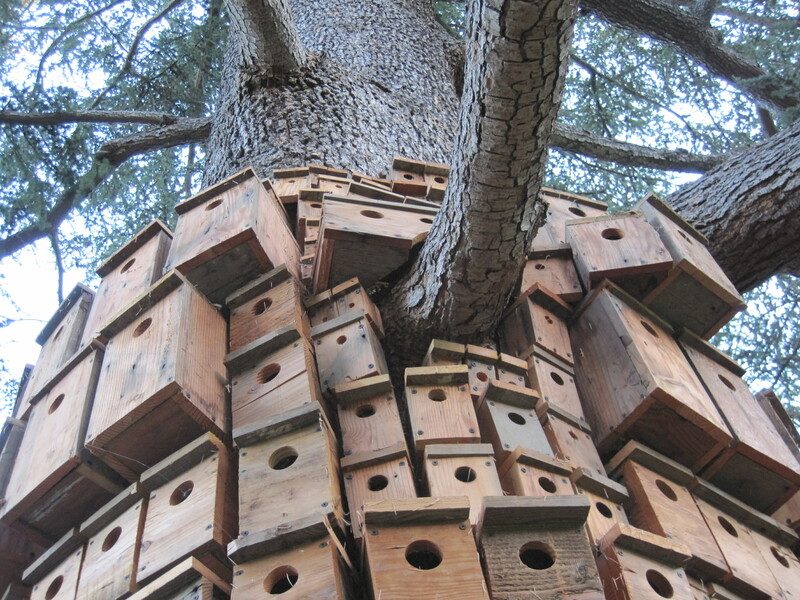 Sure enough, there on the trunk of the enormous old tree in the front garden was a curious collection of birdhouses. Starting at about 15 feet up, they huddled close together like a bunch of baby birds in a nest. Clumped smack-dab next to each other as if they were part of a really bad bird-housing development. However, before you become distracted by the apparent clutter, hear me out. The crowding began to thin as the wood huts elegantly wound their way up and around that massive trunk. Seen in the broader view, it looked more like a graceful wing, or an elegant flock of birds in flight. 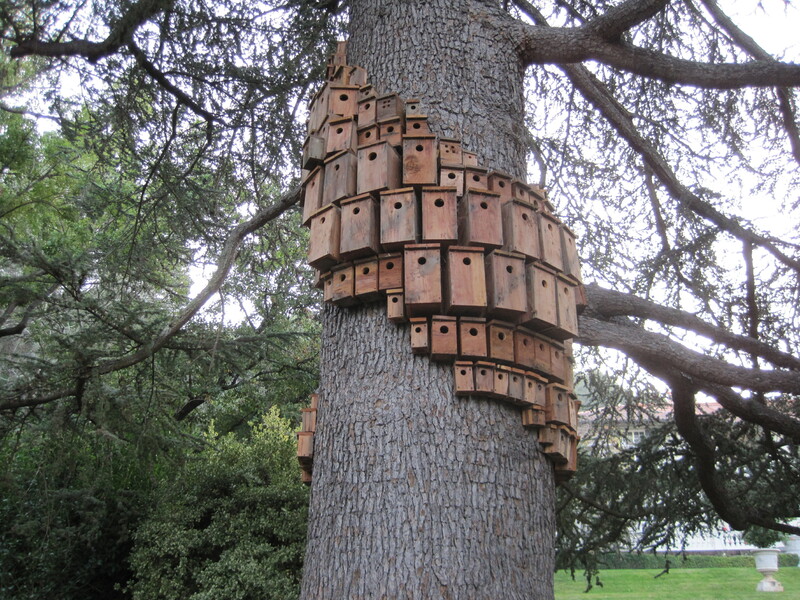 Or, perhaps it was like a curious spiraling wood bird-resort of sorts, where everybody (each bird that is) has their own little front door-hole and a killer view with plenty of space in their own private apartment. As we walked further around the tree, the idea started to grow on us, and we liked it a lot. Not a bad life for a bird in their retirement years—nice weather year round with no need to fly south for the winter. Phew! What a relief that would be. What intrigued us the most was how the timber village slowly swirled around the majestic pine, spiraling up and up as if taking flight. It was quite engaging and thought-provoking as we paused to contemplate the sculpture’s possible meaning. We have no idea what the artist’s inspiration was, and it really doesn’t matter. After all, art (using the term broadly) is trying to speak of that which is beyond words. Beyond concrete thought. It conjures up different feelings and responses from all of us, as each one sees it differently. Each moved in their own unique way. Perfect! In fact, if we pay close attention, the personal interpretations provide clues about what’s really going on within us at that very moment. So . . . 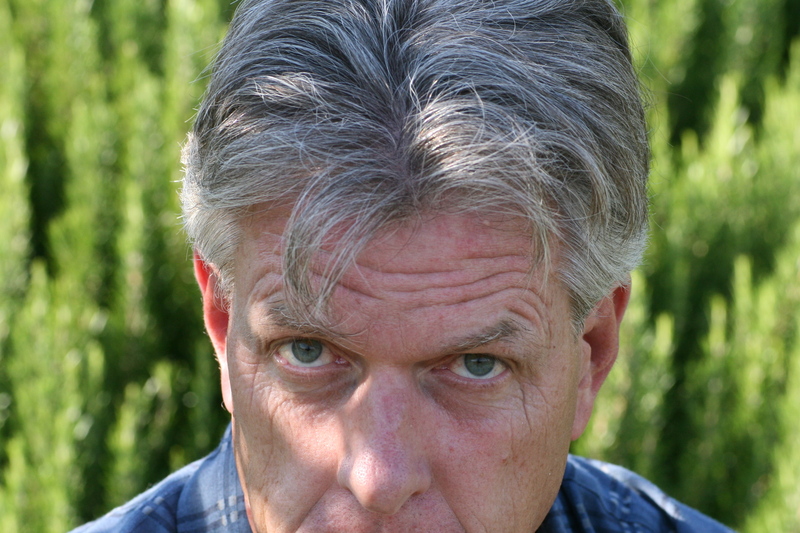 I guess that means that I’m either pondering the idea of selling everything and living the simple life in a small wood retirement village off the beaten path—or, perhaps I’m sensing the energetic rush of spiraling up and up as I see myself fly into the higher reaches of nature—out into a profound oneness with all of creation. Wow! That’s a lot to think about. On the other hand, maybe our little discovery today is urging me to simply continue walking back home, to sit in that patch of sun in the back yard by the tree, sipping some hot tea while I watch the birds flit about. Yeah . . . I’m pretty sure that’s it!